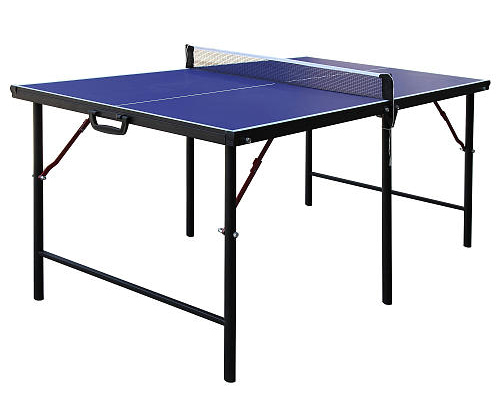 If you have an RV and do a lot of camping or you are traveling very often and need something to play with, then you may consider getting this Hathaway Crossover Portable Table Tennis Table. Many people make their decision in buying this table is due to the table is very compact and they can pack the table and bring it anywhere they travel to. The table top is made of special resin with the composition of other additives through hot extrusion and sieving. Such technology makes the table top to form a smooth and bright coating film. As a result, it can offer users with decent bouncing and good rubbing effect, as well as good corrosion resistance. If you are playing ping pong with this cool table during your outing, you may get no surprise where there will be a lot of people may get curious and coming up to you asking for information on where you got this cutie compact table tennis table. This is because the table is designed in very lightweight and easy to set up. You can set it up in no time and having fun with it right away. Even though this table is designed for family entertainment, but the craftsmanship is still followed by the professional standard. The table is constructed with lightweight material and it can be considered as one of the handiest compact table tennis tables that you can find on the market. The table can especially work out perfectly in an outdoor environment. It is featured with easy-fold design and is having a convenient carrying handle. The legs can be unfolded and perfectly lock in place so that you can have very sturdy gameplay. The net posts can be folded down for optimal portability. It can offer competitive fun for all ages. So you shouldn’t let the size stop you from playing as it can give both children and adults a lot of fun. Other than playing the game of table tennis, you do not just stop there. You can use the table to play beer pong game as well. Thus, the table is actually perfect for a variety of outdoor activities. By purchasing this table, you will also receive a removable net, 2 paddles, and 3 balls. Do bear in mind that if you didn’t play the game and keep the table in your store or basement for a long time, the table may fell apart. To avoid any damage happen to the table, it is best for you to check the table from time to time and do some simple maintenance like fold unfold the table or doing dust cleaning to ensure that the table is working and is in good shape. For a house, there are many different required to cater for different purposes. In a house, you need a dining table, studying table, coffee table, working table, and etc. With so many tables in need, there is no more space for you to allocate a ping pong table anymore if you wish to play the sport at home. At present, it is hard for you to find a universal table where you can dine, study, work and playing table tennis on it. You just need too many tables. It is very inconvenient and the tables just take up a lot of space. If you can have a multi-purpose table where you can do all the activities with it, then you will be able to save a lot of your house space. This is the time for Hathaway Crossover Portable Table Tennis Table come into play. By having this table, you can have all your activities done on this table. The quality of the table is very good. Although it is not a standard table tennis table, both adults and children can still play happily with the table. I do a simple bounce test when I try to place the ball at the height of approximately 30cm from the table, then I let the ball drop on the table top. The bounce of the ball is about 25cm. This is the bounce standard for table tennis. Thus, I conclude that this table top is meet the bounce of standard table tennis table. The coating is solid with dedicated craftsmanship. The material used is non-toxic, so it won’t do any harm to your body. More importantly, after I bought this table, I just put the table outdoor with good ventilation for a whole day. By doing so, the table has basically odorless after one day and you can place in your room without worry about getting the uncomfortable smell. I have tested the table with the formaldehyde detector that I just bought. The result shows that they are all within the safe range. So it is rather safe and won’t generate any risk that can threaten your health condition. So I feel that although the price is inexpensive, the quality of the table is quite good. It is worthwhile for you to spend money on this table which will offer a lot of fun to you and your family! I would absolutely recommend this Hathaway Crossover Portable Table Tennis Table is to anyone who is in need of a compact fun game for their leisure time. It is really small but is really playable. It is especially good for small kids. They can spend hours to play with it without feeling tired and you can also have some free time to do the thing you like to do. If you love this table, you can get it from Amazon.